"This exotic vodka drink was fashioned to celebrate the Seattle Seahawks, their team colors, and their awe-inspiring running back. 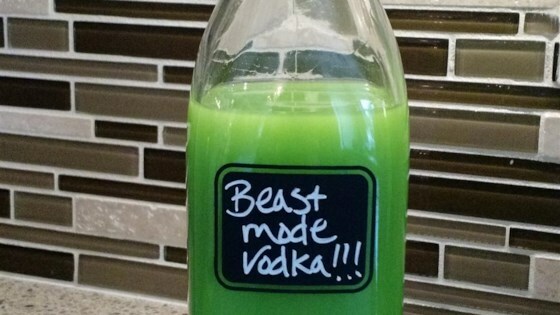 Whether you're watching the game at home or tailgating outside the stadium, this cocktail will help you get into Beast Mode and roar like a real 12th Man! Give it a Beast Mode quake, serve over ice, or shake into your favorite vodka-based cocktail. Garnish with a 12th Man flag!" Combine vodka and candies in a jar with a lid or cocktail shaker. Cover and shake until the colored candy coating has dissolved, about 10 seconds. Strain into a resealable bottle. This colorful vodka cocktail is worth 12 stars. Go Hawks! Super-easy to make. Tastes a little like a Jello shot. Take one shot for every TD the Hawks score??? Fun and tasty and perfect for the 12th man! Perfect for the Super Bowl party! GO HAWKS!! Great idea for this Super Bowl game. It is a very strong tasting drink. Gonna be great for Super Bowl party too!!! GO HAWKS! 12th man now has a delicious drink to celebrate Seattle's swag.